Here are the many variations of sole types we have on offer that we can apply to many of our shoes. This is a cement lasted shoe. 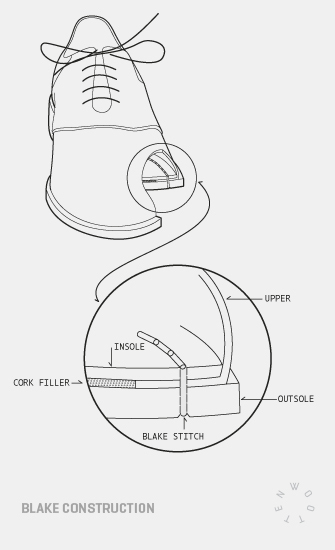 the sole is cemented to the upper and insole. It is lightweight but not stitched. the advantage of this construction, aside from being our most affordable option, is that the outsole is not perforated with a blake stitch and therefore is a little more water resistant. Also there is no stitching on the insole, which can cause some slight irritation for some people. Blake Rapid is the common name for a sole that is constructed with a blake stitched mid sole and a welt stitched outsole. It is a very durable construction and gives a similar finished appearance to a goodyear welted shoe. 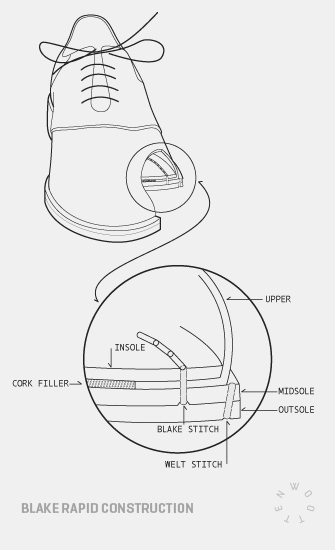 Blake stitching is typically used by Italian shoe makers. It is a stitch that goes through the inner sole and outsole. It allows for a thin and flexible stitched sole and minimal profile. This makes for a less bulky looking shoe with a soft and flexible leather sole. It is slightly lighter than blake rapid construction but is slightly less durable and a little more difficult to repair. This is the same construction as blake rapid but instead of using a 4-5mm leather outsole we use a 5mm Topy rubber outsole. It is a perfect construction for someone who is very hard on their shoes as it is easily repaired and the 5mm topy is very durable. Why Blake Rapid and not Goodyear Welted? We are able to produce a blake stitched construction and the more robust blake rapid construction using the same techniques. We can certainly make your dress shoes with golf spikes. This typically adds an extra $50 to the order. Please contact us if you wish to discuss this option.